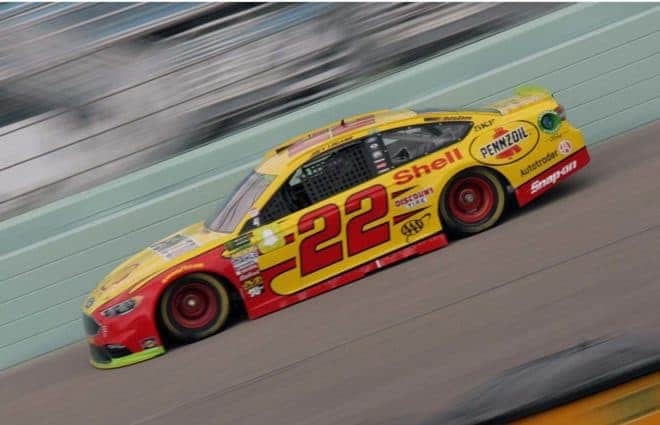 Joey Logano proved it’s good to be the champ, posting the fastest speed in an eventful Advance Auto Parts Clash practice Saturday (Feb. 9) at Daytona International Speedway. 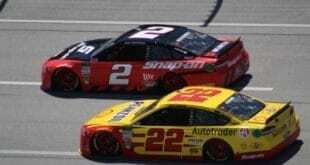 Logano led another strong performance by Ford, which saw its cars take five of the top 10 positions on the speed chart. The new Mustang, whose manufacturer dominated the last restrictor plate race at Talladega, appears to be up to speed in the draft. The practice session was marred, however, by a wreck within a few laps of the drafting pack forming. In the middle of three-wide action, Chase Elliott moved up in front of Ryan Newman heading down the backstretch, sending both cars spinning. In addition, as Denny Hamlin checked up to miss the crash, the No. 11 got tagged by Kevin Harvick, who had nowhere to go. The incident led to an extended red flag at the request of the No. 4 and No. 6 teams. Worried that low ride heights would lead to tow trucks doing unnecessary damage to their cars, teams successfully lobbied NASCAR to allow them to change tires on the backstretch at the wreck site, allowing both drivers to wheel their cars back to pit road. Both the No. 4 and No. 6 appeared repairable at the time of this posting. The same could not be said for Hamlin and Elliott, both of whom will be going to backups as a result of crash damage. Elliott, in particular, was disappointed but took responsibility for his role in what happened. Drafting activity was limited for the remainder of the session, though it wasn’t without further incident. Daniel Suarez spun his No. 41 car attempting pit road entry. However, he avoided contact in his new ride with Stewart-Haas Racing and drove away unscathed. 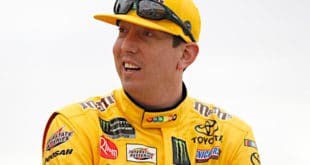 Joe Gibbs Racing spent the early part of practice working on single-car runs. Most drivers made multiple passes down pit road under green to practice pit road entry. All 20 cars entered in Sunday’s Clash took time during this practice. Jamie McMurray, running for newly-formed Spire Motorsports, had the slowest speed and stayed outside the draft. 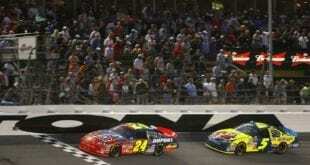 McLAUGHLIN: DOES THE DAYTONA 500 STILL MATTER? “Winning” practice is kind of like kissing your sister… it might feel good but is it really something to brag about? I guess its time to write them off. How do you “win” a practice session? That implies a lot of “losers”. If I go out, run 20 laps, learn a ton of good useful info, but finish 3rd fastest in one-lap speed, does that still make me a “loser”? Weird…. The winning practice headline re-surfaces.